This is the final part of our series; Are Tarot cards scary? The answer is a definite no. Some images might have been portrait as unpleasant but the Tarot in itself is not scary. In these pages (1, 2 and 3) we are looking at some particular cards that might show some darker images and potentially might make our client or you feel uncomfortable. Please look deeper into their meanings as all they are trying to do is show you something. It is not a prediction or a statement, meaning that you will find yourself in this situation. It is more a symbolised way of showing you a feeling or the opportunities available when we feel like we are in a certain situation. This is not necessarily a scary image, more a sad image. The person is mourning as they have lost something. There are three cups that have fallen over and their content has been spilled. Two of them are standing behind this figure. What this means is that the person has lost something and has come to grips with this loss. It also means that not all is lost the cups behind can be picked up and used, appreciated for the content that they have. This card has more an uncertain and possibly confusing image, more so than a scary image. What is the figure in the dark thinking off? Why are all these cups filled with different tricks or treasures? Sometimes we feel we are in the dark with many decisions to make about the things we need do or decide. Are we making the right decisions? How will we know? The 7 of cups shows this uncertainty to a certain aspect it might show overwhelm with all these different cups floating above us. When we make our decisions things will clear up for us. The volume of cups will disappear as we have chosen a few out of many. No one wants to be in the situation of the people of the 5 of Pentacles. So there for getting this card in a reading could potentially be scary for the client. It is however, more a symbolised way of showing we are or feel left out, or left in the cold. We mostly know why and what has happened to get into this situation. What we often don’t realise is that we have an opportunity to tab into what we value. The window showing the five of Pentacles is a reminder that we need to get in touch with what we value? We also can start thinking, how we can get out of this situation and that our chances of getting out of this situation are much closer than we think. As the pentacles are shown in a church window, it means we can go into the church be safe, secure and warm and think about our values in this environment before we head back out again in the cold (if we chose to do this). 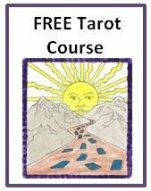 I see my role to educate people about Tarot and some of the misconceptions. Have you got a story to tell in regards to our theme scary Tarot cards? 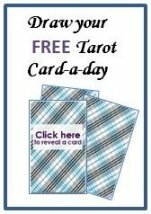 Are Tarot cards scary? Do you agree disagree, I love to hear your thoughts and possibly some of your experiences. If your experience or views contribute to explaining this topic on the site we will post it on a separate webpage.